In which part of Mexico is the resort located? The resort is located through Mexico's longest privately owned tunnel in the Pedregal neighborhood of Cabo San Lucas, providing a secluded escape within walking distance of the marina and downtown area. The cities of Cabo San Lucas and San Jose del Cabo are often referred to as Los Cabos, a popular destination appealing to leisure, luxury, and outdoor travelers alike. 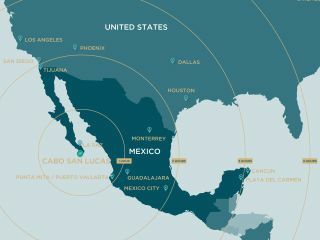 Los Cabos is located at the base of the Baja peninsula in the state of Baja California Sur on the far western coast of Mexico, boasting a cultural blend of the surrounding states. 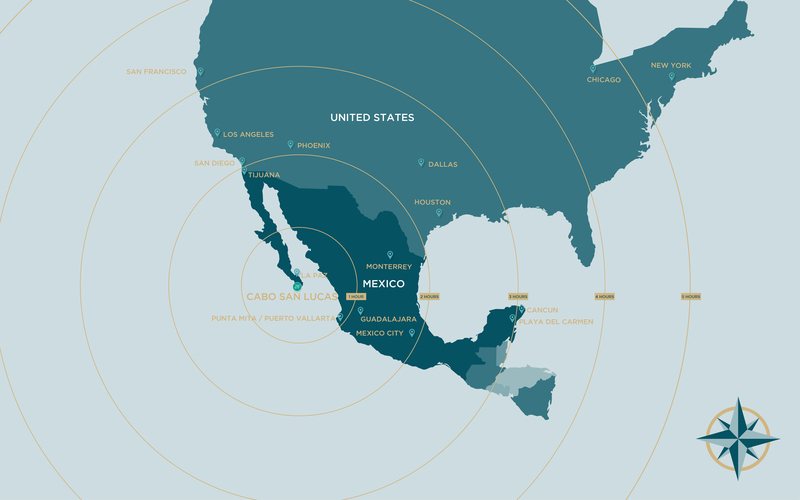 Click the map below to explore the resort's location in relation to the US and Mexico. Due to recent local regulations, the acceptance of US Dollars in cash is now restricted across Mexico. Payments with credit/debit cards remain unaffected. Please provide arrangements to settle your accounts and other expenses with a credit card. We apologize in advance for any inconvenience this may cause our guests. For security purposes, third-party booking will only be processed via wire transfer and not via credit card. Guests must present their credit card with a valid photo ID upon check-in at the hotel. What is the weather like in Cabo San Lucas? Cabo San Lucas is typically warm and sunny throughout the year, with an average temperature of 78°F (26°C). Occasional rains can be expected in the stormier months from August to October. Winters are generally cooler and nights can be chilly on the water. Late summer is hot, with daytime temperatures in the high 90's F (32°C.) and warm nights. Do I need immunizations or vaccinations before traveling to Cabo San Lucas? There are no requirements for obtaining immunizations or vaccinations before traveling to Cabo San Lucas. What should I know about electricity in Cabo San Lucas? Mexico uses 110V electricity, just like the United States and Canada. If you are coming from Europe or Asia, you will need to obtain the proper adapters. What you may need is a three-prong to two-prong adapter. Can you tell me more about travel and transportation arrangements? Major airlines with service at the San Jose Del Cabo Airport include: American Airlines, Alaska Airlines, Continental, America West, AeroMexico. The Resort at Pedregal is pleased to provide airport-resort-airport private transfers, for guests who book at least 48 hours prior to arrival, for both guests arriving at San Jose del Cabo or the private airport located in Cabo San Lucas. Our Personal Concierge Team can assist with arrangements. Yes, Wi-Fi is complimentary at The Resort at Pedregal. Can I drink the water in Cabo San Lucas? All major hotels and restaurants have purified water for your safety and convenience. Bottled water is available in tourist areas. We do not recommend drinking directly from the tap. Always drink bottled or purified water. How long would it take to get Downtown, to The Marina or to The Shopping Mall? Downtown Cabo San Lucas is just 5 minutes away by foot. The Marina is just across the street and The Shopping Mall is approximately 10 minutes at an average pace. Is it safe to walk around Cabo San Lucas? Cabo San Lucas and San Jose del Cabo are very safe places. You can walk around with no cause for concern. We always recommend guests use the same common sense they would in any town, but our neighborhoods are very warm, welcoming destinations! Are there medical facilities onsite or nearby? Yes, for your safety, we offer an on-site doctor and pharmaceutical delivery services (fees apply). There are several hospitals located in Cabo San Lucas. Can I buy Cuban cigars? Can I take them back with me? Yes, you can buy them, but you cannot take them back to the U.S. If you are returning to Canada, it is allowed, but be aware of counterfeits. Where is the nearest swimmable beach? The nearest swimmer-friendly beach is called “Medano Beach,” located 5 minutes away from the resort by taxi. Is the hotel beach swimmable? Due to strong currents we advise against swimming here. We have a swimmable beach just a short trip away, where you can snorkel in the aquarium of the world! San Jose del Cabo International airport is 45 minutes away from the resort. We suggest to all of our guests to depart the resort 3 hours prior to their flight. San Lucas International airport is 25 minutes away from the resort (domestic and private flights).